For Alexandra Dobkin (right), it’s time. After completing Hackbright Academy’s Intro to Programming class and getting a taste of the coding world, Alexandra will be starting Hackbright’s full-time software engineering fellowship in just a few weeks to officially leave behind her career in finance to become a software developer. We caught up with Alexandra to learn more about the path that eventually convinced her to pursue software engineering. Great question. I took my first programming class in high school (Java). I liked it, but I didn’t pursue it any further as my dad is a computer programmer. What high schooler wants to follow in their parent’s footsteps?! Years later, not finding my role in finance wholly fulfilling, I began to tinker around with the idea of being a data scientist. However, I was quickly informed I didn’t have the technical skills to be a data scientist. So then I decided to get some technical skills…and enroll in a programming class. My dad actually found an info session for Hackbright Academy online, and suggested that I go (the irony of my life does not escape me). I went to the full-time fellowship info session. I immediately fell in love with Hackbright: the supportive community, collaborative learning environment, the high number of external partnerships, the enthused alumnae, etc. I was sold. I was just a little bit intimidated by the fact that it was 3 months, full-time; I wasn’t ready to make that type of commitment just yet. I also feared that I didn’t have enough background experience to be accepted into the full-time program. Intro to Programming provided me with the option to get my feet wet in programming without giving up my job just yet. What was your schedule like during Intro? What was your job? During Intro, I was working as a portfolio analyst in investment management (Finance). Being markets facing, my hours were 5:30am – 3:30pm. That meant staying up past my bedtime for the night classes! I would use the time between work and class to review concepts and do homework for class. What did you think about the course? Anything unexpected? Class was fantastic. I couldn’t wait to go to class. No matter how tired I was, being in class would energize me because I found it so interesting. Taking a part-time class is very different than changing your career to attend the full-time fellowship, what motivated you to make that leap? Plain and simple, I haven’t been as excited about something in a while as I was about programming. Why not do what excites you [and pays you money]? What’s your advice to students thinking about taking Intro to Programming? Do it. What’s a drawback to becoming more relevant? Gaining more skills? Brushing up on your critical thinking? 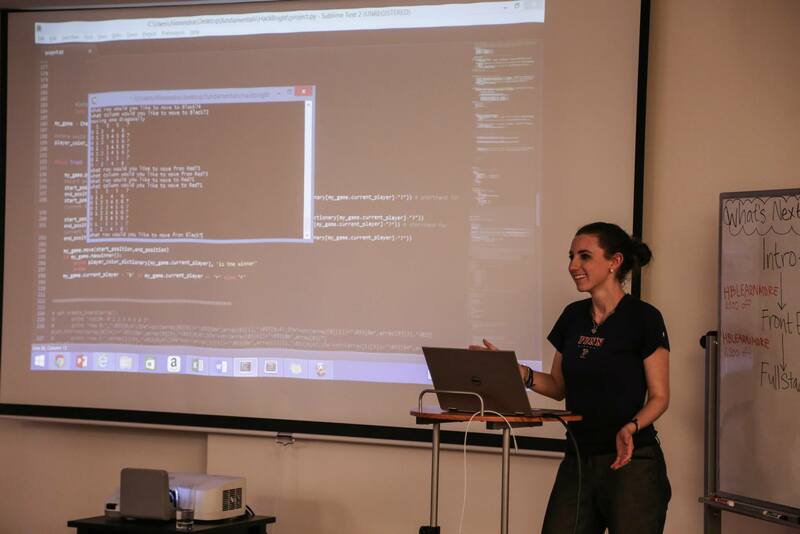 You applied and got into quite a few coding schools, what made you choose Hackbright? What were you looking for? 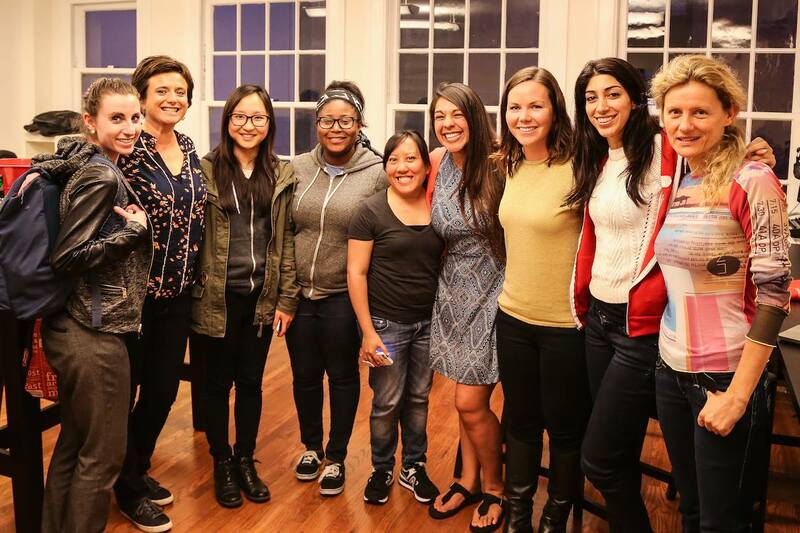 There were a few things that made Hackbright my number one choice. Based on the most recent info session that I had attended, I found out Hackbright Academy proudly has a nearly 100% graduation rate. This I found to be unique, as many other bootcamps kick out low performers. They end up looking more like a job placement agency, as opposed to being focused on investing in everyone’s learning. I find Hackbright’s job placement numbers to be more powerful than other bootcamps as a result. I also liked how many partnerships Hackbright has; at the end of the day, I need my learning experience to translate into a job offer! Hackbright Academy proudly has a nearly 100% graduation rate. This I found to be unique, as many other bootcamps kick out low performers. They end up looking more like a job placement agency, as opposed to being focused on investing in everyone’s learning. I also got a sense for what the community was like in the Hackbright full-time class. While taking the Intro to Programming class, I was learning Ruby on the side, as I was applying to a bootcamp that tested in Ruby. I would regularly study at Hackbright, as I liked the energy of the place and the couches. I was able to ask random women (students from other classes) for help, and even though they were super busy with their final projects, they would help me as much as they could. I had nothing to offer in return, except for a huge smile and a big “THANK YOU!” I also was able to witness the genuine friendship and bonds the women had formed, and I wanted that for myself out of a bootcamp. Also, Hackbright gives students two to three mentors — that’s more than what I was finding at other places. If you could give one piece of advice to someone thinking about taking Intro, what would it be? Don’t skip a single class! Take good notes. Don’t be afraid to interrupt the teacher if you’re confused. Working at a cool company that does good things, has great products, has an awesome culture, pays me well, and affords me a good work-life balance. You know, unicorns and stuff. Kris Jenner — Ultimate “momager”. She has been able to exploit — I mean lead the career path — for all of her family members (except Rob, so close enough). I would love to pick her brain on her business-savviness. My sister — her passion for the causes she believes in is unparalleled. I seek to be as ambitious and driven as her. UPDATE: Since graduating Hackbright Academy’s full-time fellowship, Alexandra has become a software engineer at Bloomberg in San Francisco. Considering a career as a software engineer? The world needs more female developers!